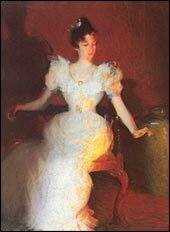 Frank Weston Benson’s masterpiece paintings of American society at the turn of the century are some of America’s most popular works of art. Born in Salem, Massachusetts, a descendant of a long line of sea captains, Benson first studied art at Boston’s Museum School where he became editor of the student magazine. 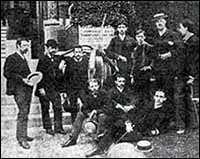 Benson’s museum class c.1882. Benson is second from the right in a straw hat. In 1883, Benson enrolled at the Académie Julian in Paris where artists such as Bouguereau, Lefebvre, Constant, Doucet and Boulanger taught students from all over Europe and America. It was Boulanger who gave Benson his highest commendation. “Young man,” he said, “Your career is in your hands . . . you will do very well.” Benson’s parents gave him a present of one thousand dollars a twenty-first birthday and told him to return home when it ran out. The money lasted long enough to provide Benson with two years of schooling in Paris, a summer at the seaside village of Concarneau in Brittany and travel in England where his painting, After the Storm hung at the Royal Academy. Portrait in White, l889. Oil on canvas. 48 l/8 x 38 l/4″. The National Gallery of Art, Washington, D.C. Gift of Sylvia P. Benson. Firelight, l893. Oil on canvas, 40 x 30″. This painting won the Ellsworth prize at the Art Institute of Chicago in l894 and the Cleveland Art Club Prize in l895. In 1890, Benson won the Hallgarten Prize at the National Academy in New York. It was the first of a long series of awards, that earning for him the sobriquet “America’s Most Medalled Painter.” In the early years of his career, Benson’s studio works were mostly portraits or paintings of figures set in richly appointed interiors. Young women in white stretch their hands out towards the glow of an unseen fire; girls converse on an antique settee in a room full of objets d’arts; his first daughter, Eleanor, poses with her cat. Works of this sort, together with a steady influx of portrait commissions, earned Benson both renown and financial rewards, yet it was in his outdoor works that gave Benson his greatest pleasure. Autumn and Spring, l895. Oil on canvas, 30 x 25″ (each painting). Museum of Art, Rhode Island School of Design. Bequest of Isaac C. Bates. Beginning in 1889, Benson and his family spent his summers in Dublin, New Hampshire, a little summer colony at the foot of Mount Monadnock. 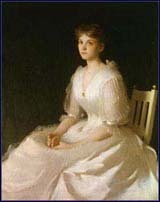 Working under the influence of the Dublin artist Abbot Henderson Thayer, Benson’s numerous works included, Summer, a painting posed for by his wife and the murals that he did for the Library of Congress. 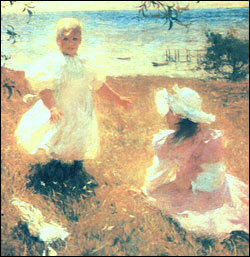 These ethereal works stand in marked contrast to Benson’s later plein-air paintings of his daughters which were praised by contemporary reviewers for being the embodiment of the “fresh, appealing American girl.” For the most part, Benson’s outdoor paintings of the 1890s tended towards landscapes and marines. Only occasionally did he venture into figural work. 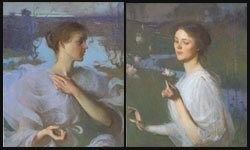 The Sisters, l899. Oil on canvas, 40 x 39 l/2″. Terra Museum of Art. This painting was first exhibited at the Carnegie Institute in November of l899 where it immediately won its first prize: $l,000 and the Silver Medal for Painting. 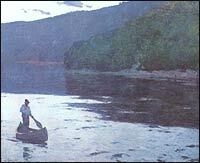 In the latter half of the 1890s, Benson summered in Newcastle, on New Hampshire’s short stretch of seacoast. It was here, in 1899, that Benson made his first foray into impressionism with Children in the Woods and The Sisters, the latter a sun-dappled study of his two youngest daughters, Sylvia and Elisabeth. The Hilltop, l905. Oil on canvas, 7l x 5l”. Collection of the Malden Public Library. The principles of Impressionism began to dominate Benson’s work by 1901, the year that the Bensons first summered on the island of North Haven in Maine’s Penobscot Bay. His summer home “Wooster Farm,” which they rented and finally bought in 1906, became the setting for some of Benson’s best known work and there, it seemed, he found endless inspiration. Benson’s sparkling plein-air paintings of his children–Eleanor, George, Elisabeth and Sylvia–capture the very essence of summer and have been widely reproduced: In The Hilltop, George and Eleanor watch the sailboat races from the headland near their house. Gaffing a Salmon, l928. Oil on canvas 43 3/8 ” x 35 3/8″. Private collection. As a boy, Benson dreamed of being an ornithological illustrator. In mid-life, he returned to the wildfowl and sporting subjects that had remained his lifelong passion. Using etching and lithography, watercolor, oil and wash, Benson portrayed the birds observed since childhood and captured scenes of his hunting and fishing expeditions. Together with his two brothers-in-law, Benson bought a small hunting retreat on a hill overlooking Cape Cod’s Nauset Marsh. Here, in the late 1890s, he began experimenting with black and white wash drawings. These paintings became so popular that Benson was not able to keep up with the demand. He turned to an art publishing company to have several made into it intaglio prints; twelve wash drawings are known to have been reproduced in this manner. At least two of them were given as gifts to associate members of the Boston Guild of artists, of which Benson was a founding member. Bluebills, l9l5. Intaglio engraving. l9″ x l5 l/2″. Reproduced by the Elson Art Publishing Company. Private collection. Benson was also an avid fisherman and his salmon fishing expeditions to Canada’s Gaspé Peninsula where one of the high points of his summer. 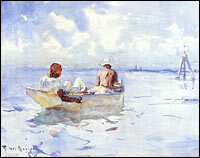 There, in 1921, he began the first in a series of watercolors that would eventually over 500 works. Souvenir of Florida, 1930. Watercolor on paper, 19 x 24″ . Private collection. 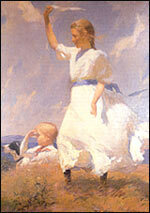 Benson also painted a number of sporting scenes in oil. In such dramatic works as Hunter in a Boat one can sense the cold, biting damp of a New England winter day chilling the hunter as he pulls his boat through the choppy sea. This work, which depicts Black Rock Ledge not far from Benson’s home in Salem, was one of his earliest sporting oils. Twilight, 1930. Oil on canvas, 43 3/8 x 35 3/8″. Private collection. Twilight, done nearly 20 years later, is a sporting work in an entirely different vein. More landscape than figure study, this painting expresses Benson’s feelings about life in the wilderness. The tiny man silhouetted against a small patch of silver water is insignificant. His being is subordinated to the grandeur of the looming mountains and the power of the swift stream. 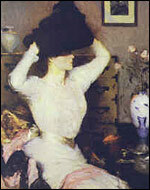 The Black Hat (Lady Trying on a Hat), l904. Oil on canvas, 40 x 32″. Museum of Art, Rhode Island School of Design. Gift of Walter Callender, Henry D. Sharpe, Howard L. Clark, and William Gammell. The Silver Screen, Oil on canvas. Collection of the Museum of Fine Arts, Boston. Beginning around 1919, Benson began a series of true still lifes. Many of these handsome tabletop arrangements, composed of objects gathered by Benson’s seafaring ancestors on their trips to the Orient, have found homes in America’s major museums. These porcelains, candlesticks, Oriental screens, and embroidered silk tablecloths, have been arranged and rearranged by the artist to create a number of a handsome compositions. Still Life, date unknown. Oil on canvas, 54 x 59″. National Museum of American Art, Smithsonian Institution. Henry Ward Ranger Fund. 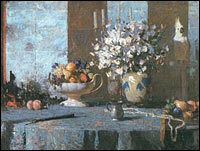 Numerous accessories in Benson’s still lifes reappear in several paintings. The silver screen featured as a backdrop in Still Life— winner of the Henry Ward Ranger Fund prize and now at the National Museum of American Art–is the same screen that Benson used in The Silver Screen from the Museum of Fine Arts, Boston and Still Life Decoration at the Chicago Art Institute. 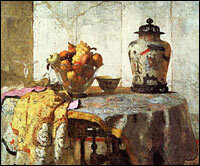 The oriental jar in The Silver Screen is also used in a still life now owned by the Corcoran Museum of Art. 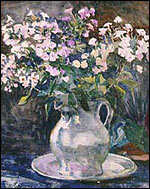 Phlox in a Pewter Pitcher. In addition to oils, Benson also used watercolor as a medium for executing still lifes. Most often these paintings, such as Nasturtiums in a Vase, or Phlox in a Pewter Pitcher were arrangements made from flowers gathered from Ellen Benson’s gardens at North Haven. While many collectors know Benson as a painter, a totally different group of admirers are aware of him only as an etcher of sporting scenes. It is almost as though there were two Bensons. Lighting In, etching, 7 7/8 x 10 7/8″. Private collection. 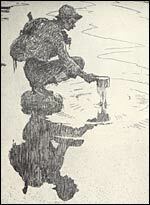 A Cup of Water, etching. 6 7/8 x 4 7/8″. Private collection. With the etcher’s needle, Benson was able to command the same mastery of light that he demonstrated years before in his sun-drenched paintings of his children on an summer hillside. Whether in a subtle portrait of his wife doing her hair by candlelight, a guide dipping a cup of water from a mountain stream, or a group of boats reflected in the water, Benson’s mastery of etching was greeted with overwhelming praise by critics. Exhibitions of his etched work were held in every major city in America as well as in London. Benson has often been credited with being the founder of the school of the American sporting print and his etchings sell as briskly now as they did eighty years ago. 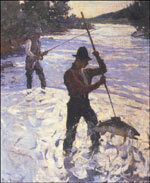 Benson began winning awards in l890 with his dramatic interior studies, won national and international recognition for his luminous plein air paintings in the early 1900s and was still garnering prizes in the 1920s and 1930s for his watercolors of sporting scenes and his stunning oils of birds. 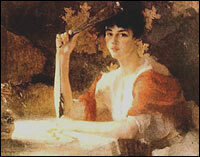 Benson’s last prize was awarded to him for his etchings at the age of 86. 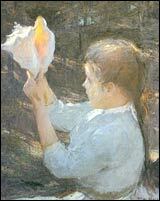 Child With a Shell, 1902. Oil on canvas, 30 x 25″. Private collection. Of all the painters of his generation, Benson alone was able to keep his work fresh and current with contemporary tastes. In the 1930s, when many of Benson’s contemporaries were putting down their brushes, critics were still describing his work as “fresh and vital,” or as “contemporary” or noted that it captured “the essence of the life of today.” Few artists have had so long or so successful a career in so many media. 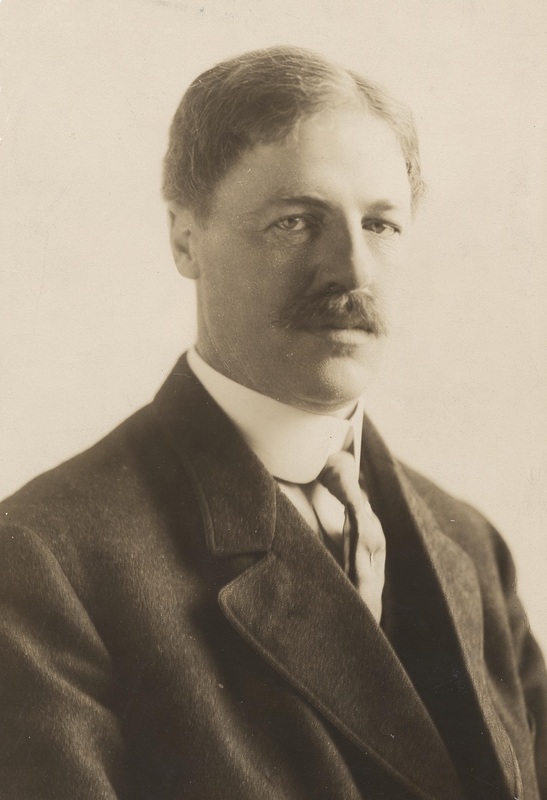 His studies of his family, wildlife and sport, won for Benson not only every award of his day and the respect of his peers but also the admiration of both the public and the critic as well. His father’s fears that he would become just another “starving artist” were never realized. Benson became not only one of the most admired artists of his day but was able to provide handsomely for his family by his career. Except for those works that Benson gave to friends and family, almost everything he created was sold. Red and Gold, 1915. Oil on canvas, 31 x 39″. Butler Institute of Art, Youngstown, Ohio. As Benson once said, “A man’s best chance to produce something which will please others is to represent as faithfully as he can what pleases him, in the way he likes it best.” He succeeded admirably. 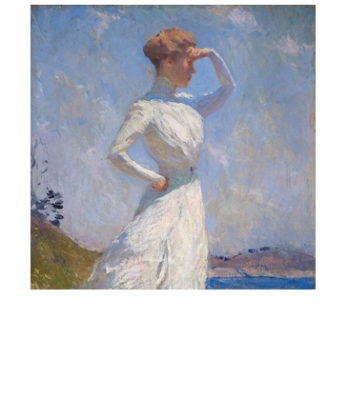 To read more about Benson’s life, see the biography Frank W. Benson: American Impressionist, available in the bookstore of this site. Or visit the Benson page on Wikipedia.